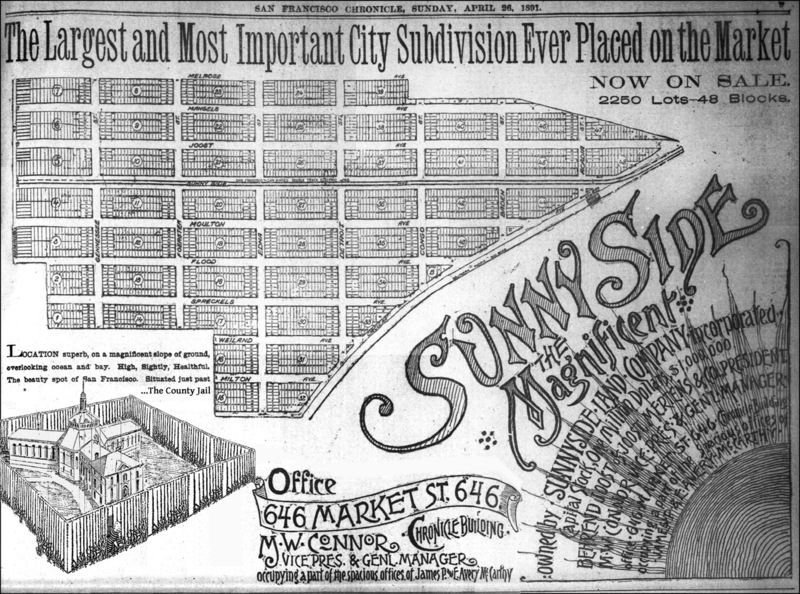 Half-page debut ad for Sunnyside, altered! SF Chronicle, 26 Apr 1891. Click for larger. There had been a jail there in some form or another since the 1850s; the city originally bought the 100-acre House of Refuge lot in 1854, when it was far, far from the city. 1869 Coast Survey map, altered: House of Refuge lot marked in green. Click for larger. From DavidRumsey.com. The jail fences on the northeastern side touched Havelock Street, Sunnyside’s southernmost street. The compound had different names and reformatory functions over the years: House of Refuge; Industrial School; House of Correction; Branch County Jail No. 2; finally Ingleside Jail, after 1906. 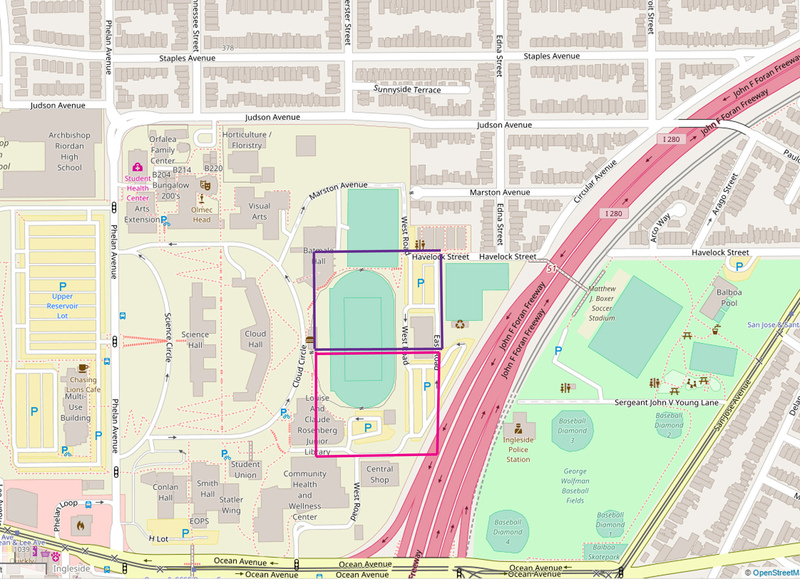 2017 OpenStreetMap, altered to show locations of men’s jail (purple) and women’s jail (pink). OpenStreetMap.org Click for larger. 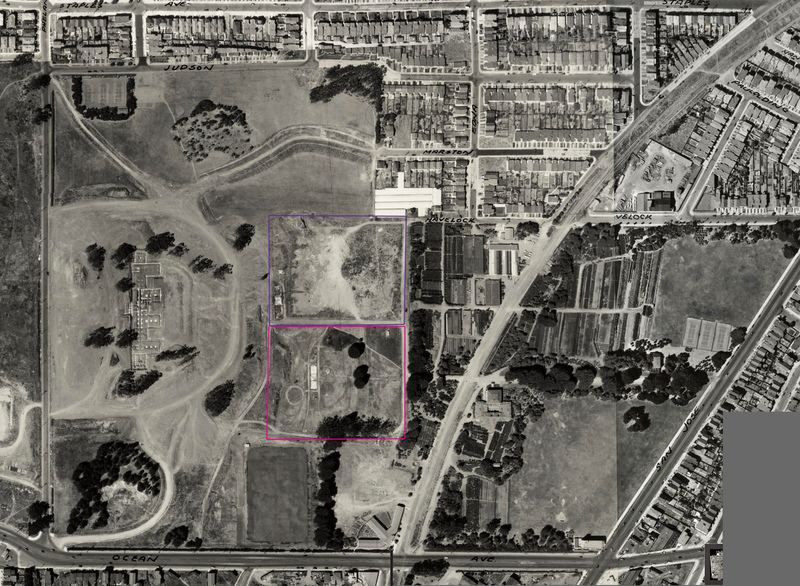 1938 aerial photo, altered to show location men’s jail (purple) and womens’ jail (pink) shortly after buildings demolished. From DavidRumsey.com. Click for larger. At all points in its history it was in theory supposed to house only those inmates who: had short sentences; were not guilty of federal crimes; were thought reformable. In fact it was an appealing alternative for San Francisco convicts who had enough money to bribe their way into serving their sentence at “The Sheriff’s Ranch,” as the jail was known(1), thus avoiding the dreaded fate of the much harsher state prisons like Folsom. As a result, it put alimony-scofflaws in beside murderers, and was always an excellent place to learn the finer points of the illegal trades. SF Chronicle, 30 Aug 1912. SF Chronicle, 12 Jan 1912. SF Chronicle, 1 July 1916. SF Chronicle, 14 Mar 1916. SF Chronicle, 17 Mar 1916. SF Chronicle, 5 Aug 1920. SF Chronicle, 12 Sept 1929. SF Chronicle, 13 Sept 1929. Inside women’s jail at Ingleside: women in cell. From http://www.sfsdhistory.com. The men had a newer and bigger building, built in 1876, considered the height of enlightened practices at the time. The two larger wings held the inmates, the smaller one was residences for the administration and other staff. There was a central octagonal hall. Ingleside Jail (men’s) in 1920s. From southeast corner of compound. OpenSFHistory WNP30.0129. The grounds and outbuildings were extensive; there were farm animals and vegetable gardens; a well and large water tank; a large kitchen; a laundry; construction and shop facilities. The compound was all encompassed by a 16-foot wooden board fence, installed when the building was constructed. It was an infamous feature of the jail, as it proved an insufficient deterrent for various determined escapees armed with small saws over the decades, as well as blowing over in strong storms. At frequent intervals from the 1880s to the 1920s, the Board of Supervisors or the Grand Jury called for it to be replaced with brick or stone, but it never was. Jack Black and Harry Davenport escape Ingleside Jail. SF Call, 5 Jan 1912. Black had resided at Ingleside Jail since 1906, moved there with all the inmates from the Broadway Jail, which burned down in the Great Fire. Many prisoners waited years at Ingleside while lawyers wrangled over restoration of police records, all burned in the Fire. When he left in 1912, he was on the verge of finally being sent to Folsom, his expensive lawyers and connected friends having failed at preventing it. Enterprising as always, he had made a small fortune during his years at Ingleside, and left the jail with a money belt full of cash, $3000 ($76K now) and “a suit of the finest cloth and latest cut.”(5) It was reported that he won much of it gambling with Abe Ruef during the Boss’s stay at the jail. This seems a bit unlikely, as Ruef was only there for two fairly brief periods, in 1908 and 1911. Original cover of Jack Black 1926 memoir. Jack Black, toward the end of his life. The escape happened after midnight on 5 Jan 1912. Stories about how he and Davenport got out were varied and speculative. One of the only witness reports revealed that at 1 am, two owl-car drivers on the 10 Sunnyside streetcar line spotted two men waiting near a large saloon auto at the corner of Edna Street and Sunnyside Ave (now Monterey Blvd). 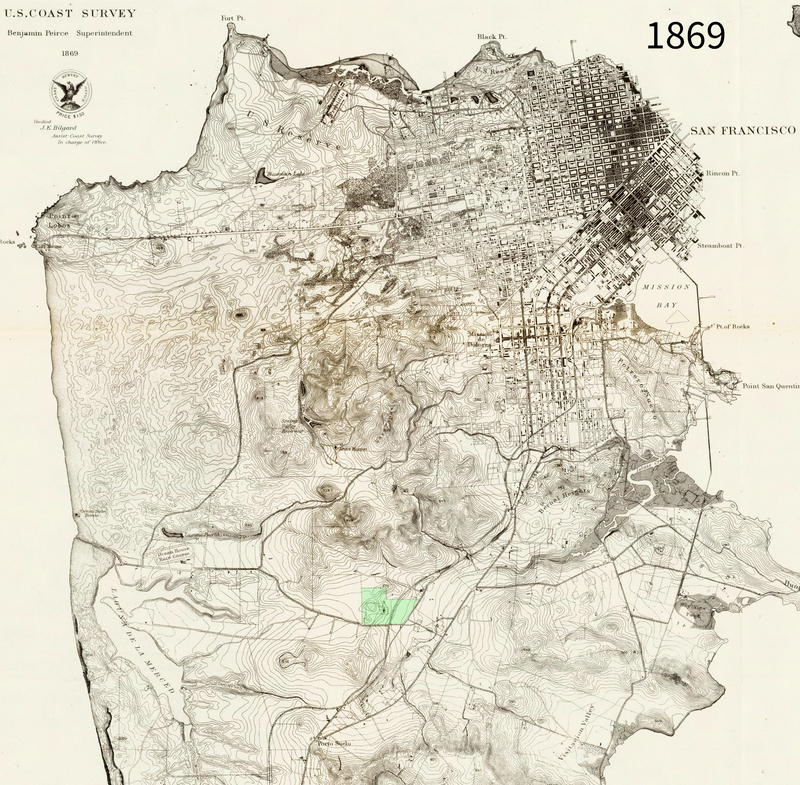 (8) “At the edge of the Sutro Forest” was how the location of the rendezvous point was described. Black maintained silence to the end about how he got free, thieves’ honor still counting for something; he insisted in his memoir he took the streetcar, rather than reveal that there was a third person helping him and Davenport with an automobile. Drug-smuggling was a perennial problem at the jail, long before and long after Jack Black ran his famous operation. The methods of getting the stuff into the jail and distributing it were varied and clever—the best methods, being undiscovered, are of course lost to history. SF Chronicle, 18 Aug 1928. Gussie Kennedy, one of the sharper matrons, caught a visitor slipping something to his inmate girlfriend. She sat on him until he handed it over. Matron Kennedy stops a drug drop in the women’s jail. SF Chronicle, 9 Nov 1926. For quite a while, no one did choose to live on the blocks nearest to the Ingleside Jail. Then things began to heat up during the 1910s. More houses were built on that side; nearby neighborhoods were also filling out. 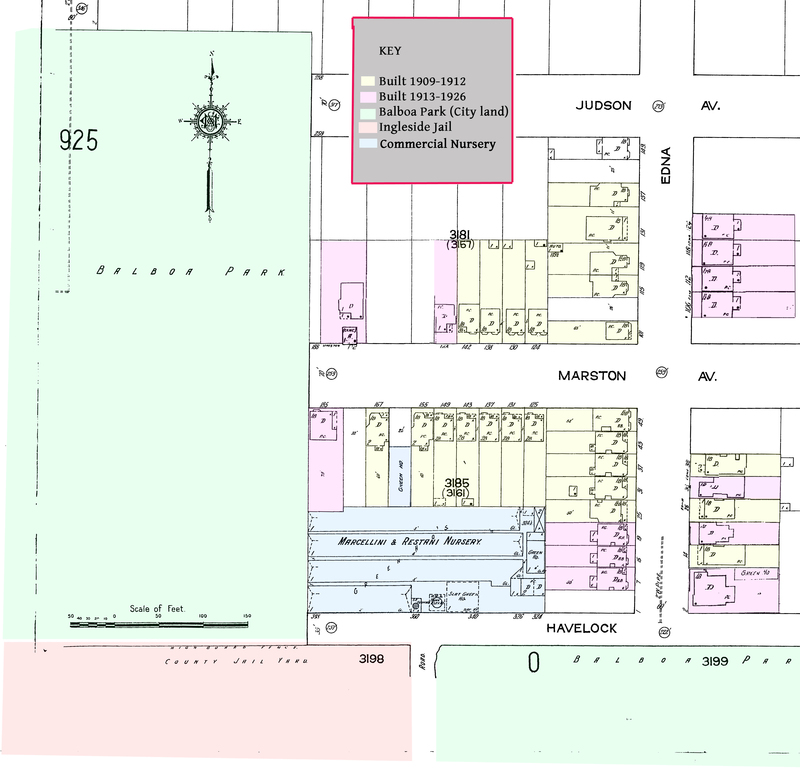 1915 Sanborn map, altered, with additional information through 1920s, showing development of blocks nearest the Ingleside Jail (marked red-orange, lower left). Click for larger. There came a public outcry to have the jail moved elsewhere. Who would want a massive jail complex smack in the middle of a park? Activists from nearby neighborhoods petitioned repeatedly to have the jail removed. In 1912 Sunnyside residents accused the jail superintendent of diverting water that should have been supplying Sunnyside homes. Ingleside Jail is diverting Sunnyside’s water. SF Chronicle, 28 Sep 1912. SF Chronicle, 1 Oct 1912. The jail had been cultivating extensive vegetable fields borrowed from the Park Dept to the east of the compound for years. Under Sheriff Tom Finn the gardens expanded to point of such overabundance that the administration sold off most of the produce, largely potatoes and cabbages. That lobbying, answered by a string of promises from the Board of Supervisors, went on for more than twenty years. SF Chronicle, 4 May 1929. SF Chronicle, 26 Apr 1924. By 1930 a new location was seriously being sought; it took a change in state law to allow SF to build its jail outside the county lines. The new facility in San Bruno was finished in 1934. SF Chronicle, 26 June 1934. Most of the 100-acre House of Refuge lot would then be used for City College of San Francisco. The I-280 Freeway, built in the 1960s, would divide the lot irrevocably, as it did the surrounding neighborhoods. What’s in a jail name? There was a change in status from the House of Correction to county jail in 1892, and the institution thereafter was known as branch county jail no. 2. (The jail downtown on Broadway was no. 1.) It wasn’t called Ingleside Jail until about 1906. Then, in July 1906, I find the first instance in the newspapers of the use of the name “Ingleside Jail,” in a piece condemning the institution as a deathtrap. (19) All the prisoners from the downtown jail had been relocated there after the Fire in April of that year, and it had perhaps risen in the public consciousness as a result. And so it was known until its closure in 1934, 58 years after the building’s construction, and 76 years after the property was first used for confining prisoners. 2. According to oral histories recorded 2000-2006 by the Sunnyside History Project, available in print at the SF History Center, Main Library. 3. Full breakdown from the 1910 US Census: 310 male inmates; 39 female inmates; The superintendent and his wife and two children; 11 deputy sheriffs; 2 guards; 5 drivers, including one with a wife and five children living there; 1 bookkeeper; 4 jailers; 2 matrons, each having two children; and 1 physician. 4. “Women quit ancient jail,” SF Chronicle, 30 Nov 1930. 5. “Two desperate criminals give Finn the laugh,” SF Call, 5 Jan 1912, p1. 6. Jack Black, You Can’t Win, Edinburgh: AK Press/Nabat, 2000, p246. 7. “Trusties ‘dope’ ring in county jail broken up,” SF Call, 6 Feb 1912, p1. 8. “New clew found to jail delivery,” SF Chronicle, 9 Jan 1912, p9. 10. “New Canadian treaty fails to save Black,” SF Call, 1912 Nov 15, p4; “Noted felon arrives; Silent about escape,” SF Call, 25 Nov 1912, p7. 11. “SF jail breaker found in prison,” SF Chronicle, 18 Dec 1918, p15. 14. “Prisoner tried to get dope into jail,” SF Chronicle, 31 Jan 1925, p11. 15. “Three in net for smuggling narcotics to jail inmates,” SF Chronicle, 26 May 1926, p3. 16. “Love jails her,” SF Chronicle, 18 Aug 1928, p4. 17. “Perfecting plans for Balboa Park,” SF Call, 12 June 1910, p52; “Balboa Park is to be put in shape,” SF Call, 4 Aug 1910, p5. 18. “More parks are luxuries the City cannot afford,” SF Chronicle, p27. 19. “Ingleside jail is a death trap,” SF Chronicle, 18 July 1906, p3. Outstanding article on the neighborhood around the old Ingleside Jail. Very nice use of news articles about the jail and its problems. Congratulations on a good story.